1. Begin with the rice. Wash it well and then soak it. 2. Take the sliced onions and fry them till they turn golden brown in color. 3. Put some water in the saffron and let it soak. 4. Take ginger, red chillies, garlic and almonds and grind them together. Add this to some butter and fry. 5. 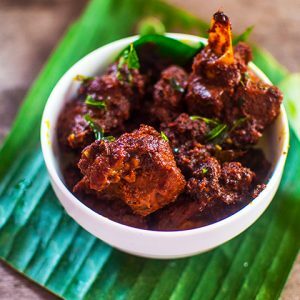 Next, take the above fried masala and add it to the mutton and salt stir the whole thing for the next 5 minutes. 6. Add water to the mutton and cook till the mutton becomes soft. Also note that about 1 cup of gravy should be left behind. 7. Put rice in another pan. Add salt to it and let it boil. 8. Take the curd and place it on a piece of muslin cloth. Wait for a while and allow the water to drain away. Next, add to this, cloves, cardamoms, cumin seeds, mint leaves, chopped chillies and coriander. 9. Also, drain away the water from the saffron and add lemon juice to it. 10. Put the above ingredients to the mutton. 11. Take half of the boiled rice and spread it over the mutton as a layer. Follow this with a layer of fried onions and then of rice again. 12. Pour some milk and butter into it and cover the vessel. 13. Take some flour paste and use it to seal the edges of the vessel. 14. Place the vessel on the flame for an hour. 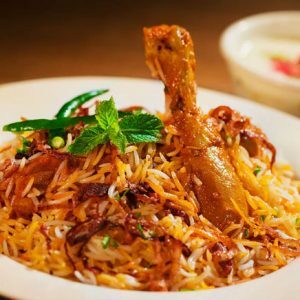 Feel free to comment or share your thoughts on this Shahjahani Biryani Recipe from Awesome Cuisine.